Napoleon Grills is one of the most recognizable names when it comes to grilling. Napoleon Grills offers a full line of reliable grills featuring great looks and affordable quality. A history of innovation has helped Napoleon Grills create unique grills that stands out above the crowd. The Napoleon Grills Prestige PRO 825 with Power Side Burner and Infrared Rear and Bottom Burners Propane Gas Grill is the ultimate grilling machine. It features a modern storage pedestal and soft-close doors and drawers. Two generous side shelves offer added prep surface, but also feature an integrated ice bucket, beverage, sauce, tool, & towel holders on one side and a two-stage power burner on the other side. The Napoleon Grills Prestige Pro 825 also features interior lights and improved night light back lit control knobs for nighttime grilling. 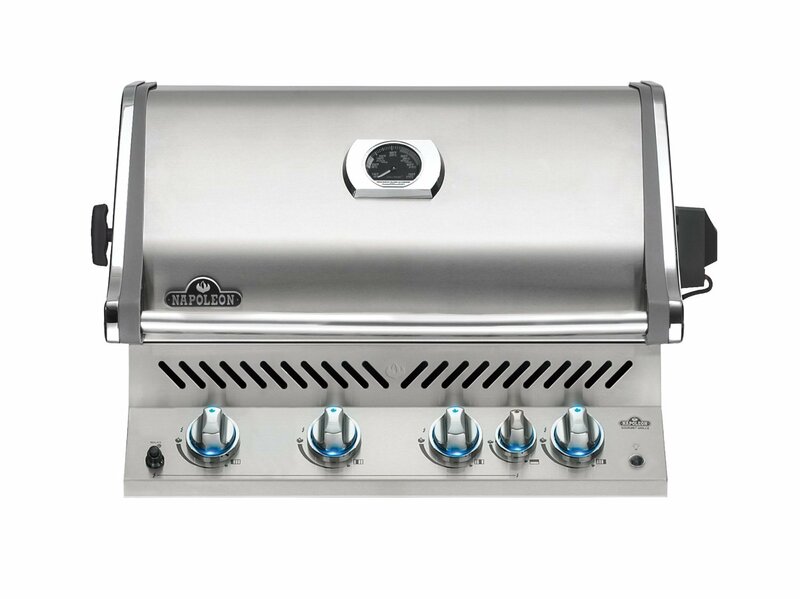 The Napoleon Grills Prestige PRO 665 with Infrared Rear and Side Burner Stainless Steel Propane Gas Grill features 8 burners and can grill up to 42 hamburgers at once. While you’re busy grilling up the perfect steak, or slow grilling the perfect roast, you can cook amazing side dishes on the ceramic infrared side burner. 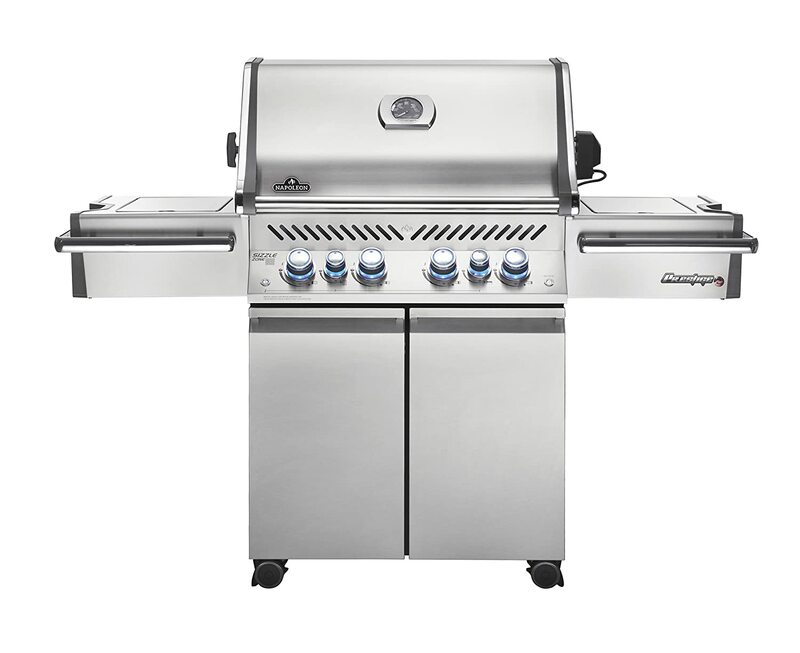 The Napoleon Grills Built-in Prestige PRO 825 with Infrared Rear and Bottom Burners Propane Gas Grill is the perfect addition to any outdoor kitchen. Use the rear burner for a rotisserie meal, or the dedicated infrared bottom burners for the perfect sear. Turn this gorgeous grill into a smoker too, with the integrated smoker tube & dedicated burner; you can even grill with charcoal using the optional charcoal tray. Redesigned knobs show off bright LED lights and interior lights make for late night entertaining easy. 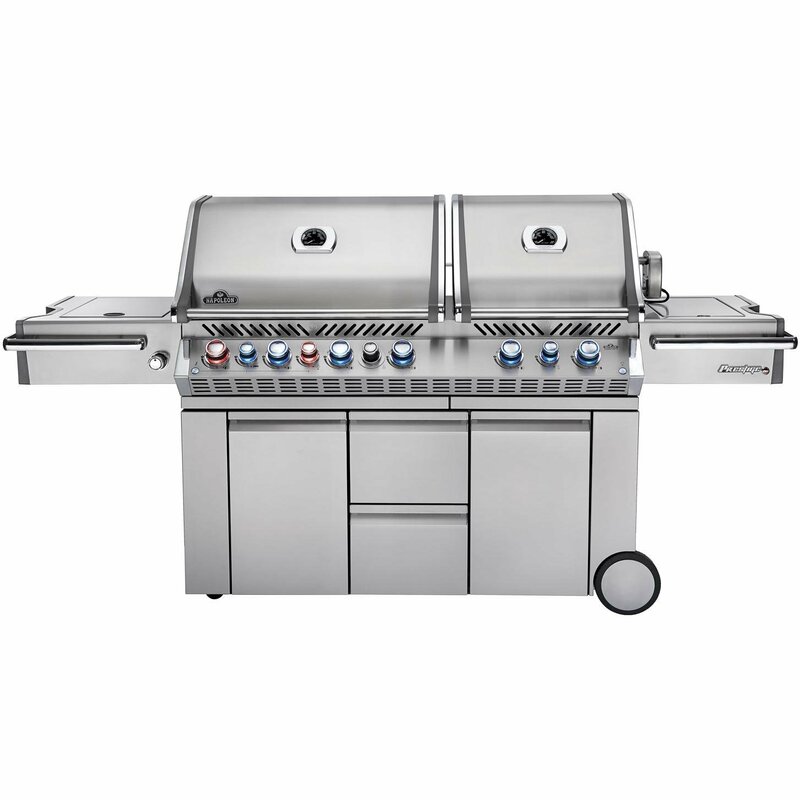 The Napoleon Grills Built-in Prestige PRO 665 with Infrared Rear Burner Stainless Steel Natural Gas Grill is the perfect grill for your outdoor gourmet kitchen. 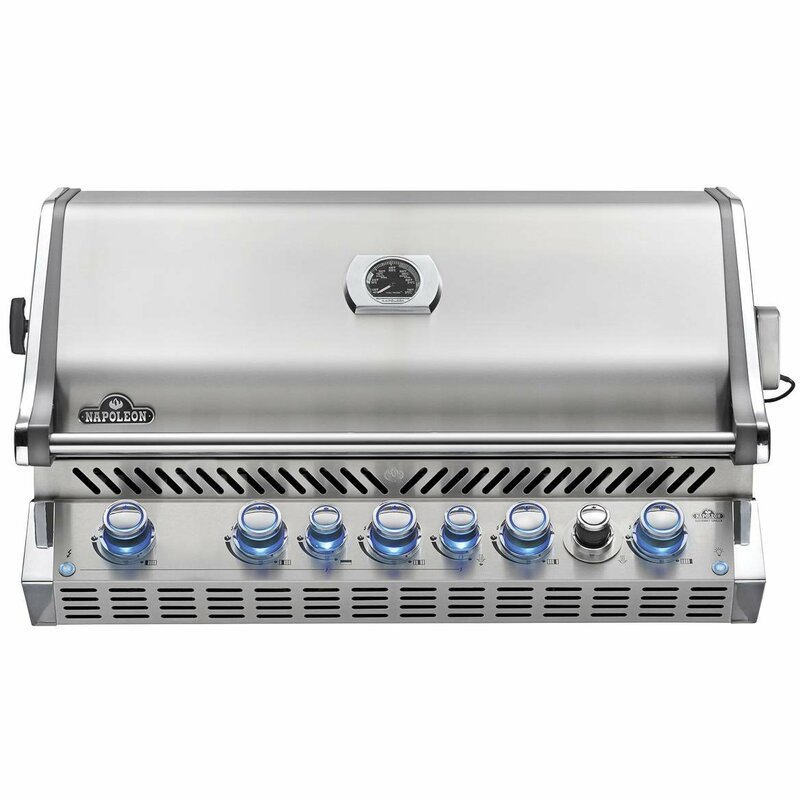 A versatile grilling experience is at your fingertips with the built-in Prestige Pro 665 . Grill low & slow, or sear high & hot, you can do it all including grilling up to 42 hamburgers at once. An integrated smoker tube & burner instantly turns your gorgeous grill into a smoker for all of those briskets and ribs. Interior lights let you grill well past dark without worry of burning your food. 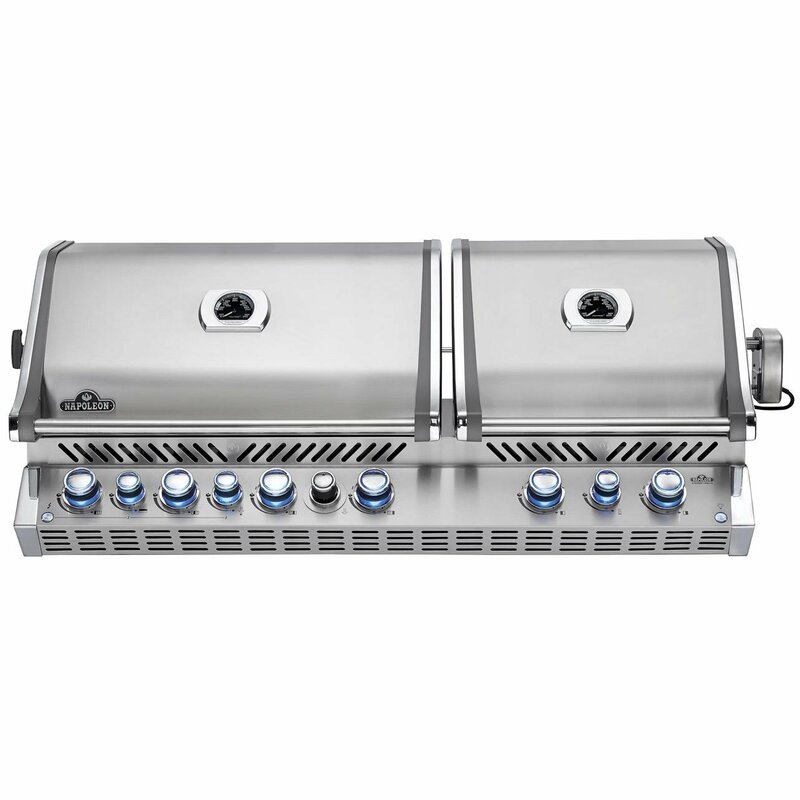 The Napoleon Grills Prestige Pro 500 Built In Natural Gas Grill, Stainless Steel comes with the highest standard components, featuring our heavy duty stainless steel cooking system, ergonomic control knobs, LIFT EASE Roll Top lid and rear rotisserie burner for restaurant style results. Napoleon Grills boast high-end craftsmanship and a multitude of uses with a minimalist aesthetic. Investing in Napoleon Grills is really investing in a functional work of art, as all Napoleon Grills are made to look sleek and beautiful while ensuring the best grilling experience. For any type of grilling need, Napoleon Grills has it covered: from Napoleon Gas Grills, Napoleon Portable Grills, and Napoleon Charcoal grills, there is a high quality option for any grilling enthusiast. Napoleon Grills started as a steel fabrication business named Wolf Steel Ltd. This business grew from manufacturing steel railings in 1976 to producing cast iron wood stoves. In 1981, Wolf Steel created the first single high temp ceramic glass door stove and called it the “Napoleon.” This unprecedented event created demand in the company, and they expanded their expertise to include Napoleon Grills. Today, Napoleon Grills is the largest privately owned manufacturer in North America for gas grills and wood grills.